Curator Herbert Collins in political history storage areaPhotograph by Richard Hofmeister, Neg. No. 76-13488-18. Courtesy of Smithsonian Institution Archives. My essay was inspired by the 50th anniversary of the NMAH. I used to work there, and a former colleague asked me to write something. The director was eager to have the museum’s anniversary noted at various scholarly organizations, he said. I gave talks based on the research for this paper at the National Council for Public History conference last year and the Society for the History of Technology Conference in October. But whether this was the kind of history the director had in mind – I don’t know. It’s fairly critical, both of the curators, and of the museum’s management. I argue that the museum’s management was never able to figure out how to build and use the museum’s collections as a part of its mission. 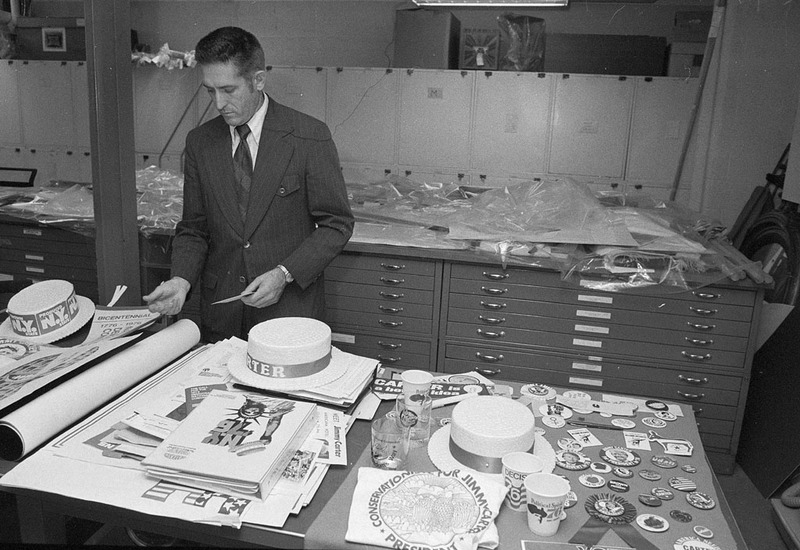 Curatorial prerogative was the watchword of the Smithsonian when the museum was founded. It has remained so, at least through the most recent of many hand-wringing “what about the collections?” reports, a decade ago. Curatorial prerogative has not shifted with the changing goals of the institution; that’s a managerial failing. But perhaps the curators were fighting the good fight, and management misguided? My reading of the archives suggest that the curators never really figured out how the collections could be useful, either. In the early years, they adopted a philosophy of collecting based on natural history. But they were never able to make a good argument for history collections, beyond the small fraction that were put on display or, for a few of the curators, their own research. Not that they haven’t tried – I suggest that the material culture movement of the 1980s came out of an attempt to provide a rationale for all those artifacts. At the urging of the editor of the journal, I added a conclusion looking at the recent past, and into the future. How might collecting philosophy change to make collections more useful? How might the smaller number of curators now at the museum cover the territory they need to? I suggest that taking advantage of new technologies to allow curators to connect the public with collections might help them make a case for collections in a way that the “potential research” argument never did. It was a bit odd, and also fascinating, to write about a place where I used to work, and about a history that I had some connection with. What I wrote is not a memoir, though, like Bob Post’s recent book on the museum; I tried to keep my distance. But I kept thinking: I wish I knew this history when I was there. Working in a bureaucracy, in a big institution, one takes for granted the way things are done. Tradition, and the myth of a golden age, are powerful. Knowing the history – how it came to be that way – would have made it easier to question it, to think about how things might change. Perhaps this essay, and other historical work on the museum, will help encourage new thinking not only about the past, but also the future.